So often there is a disconnect between the mom I am, and the mom I want to be. Or make that the mom I think I ought to be. A lot of times, I feel like Julia Roberts’ character Isabel in the movie Stepmom. In the opening scene, Isabel is frantically trying to get her live-in boyfriend’s two children ready for school. She struggles with making them breakfast, getting them dressed, and even finding the youngest child, who has hidden himself in one of the kitchen cabinets. She has a moment of panic when she realizes that she hasn’t washed the daughter’s shirt for Purple Shirt Day, and as she suggests that the girl just wear orange instead, she’s met with eye rolling and obvious disdain. Just like the stepmom, I live in the shadow of a better, more organized, more patient mom. The one I’ve created in my head. She shows up whenever I’m feeling defeated, frustrated, or just having a hard time keeping up with the demands of two children and all the housework. She whispers to me that I’m a failure. She looks at me with contempt, saying smugly “Why can’t you get it together?” She follows me around throughout the day, constantly criticizing everything I do and the way I do it. The so-called “real mom” is who I measure myself against. As moms, we usually know somewhere in our heads that we are what’s best for our children. That God gave them to us– not the lady next door, or the woman in church who seems to have it all together. But getting our hearts to believe that can be another story. When we’re honest, many of us face a nagging fear that we just don’t measure up. 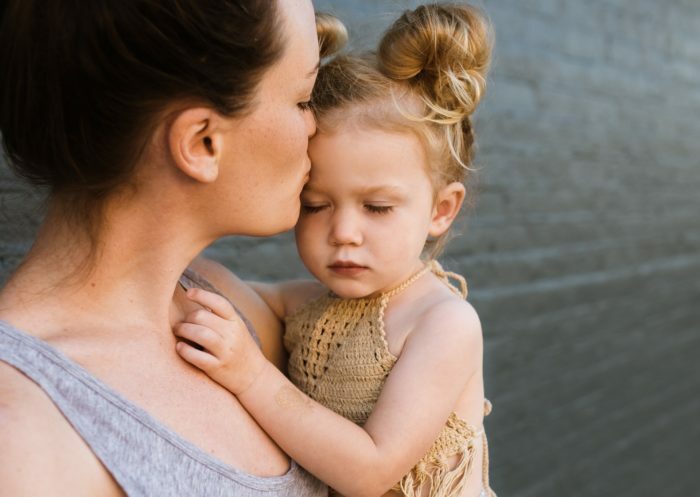 It can be easy (and quite discouraging) to look around and assume other moms are on top of all the things… that we’re the only ones who ever struggle. So, I’d like to debunk a few discouraging myths that just aren’t true (though they feel that way). Myth #1: “Good Christian moms” have children with stellar behavior. Kids have sinful natures, and contrary to popular belief, they are not extensions of ourselves. It takes time and effort to train their character and bring them up in the discipline of the Lord. But the Holy Spirit can and does work in the lives of our children. He’s working right now. We just may not see the fruit for a while- a long while in some cases. Our responsibility is to be faithful; change is up to God. Myth #2: “Good Christian moms” never struggle. While some moms make it look easy to gracefully manage their home and sometimes a homeschool to boot, we all struggle at times with balance. Each role you fill—mother, teacher, disciplinarian, cook, manager of your household, etc.—includes a broad range of tasks. So give yourself credit: you love your children and are striving (albeit imperfectly) to follow God during this unique season. That is a praiseworthy thing indeed! Myth #3: “Good Christian moms” always know how to help their kids with the challenges they’re facing. We all long to speak just the right words that will reach our children exactly where they’re at in life. We desire to help them overcome negative character traits. Or handle disappointment with grace. Or navigate their crises with friends and peers. But sometimes our words fail us. Sometimes our children have hard, stubborn hearts. Sometimes our own behaviors model something entirely opposite of what we’re telling them to do. And sometimes situations are completely out of our control. Your child didn’t come with instructions. But you can go to God’s Word for help, and you can pray to the One who formed your kids in the womb and therefore knows them even better than you do. When I’m really struggling to help my child in a particular area, I’m reminded that I can’t rely on myself. I need to fall on my knees and beg for God’s wisdom and strength. Myth #4: “Good Christian moms” love every minute with their kids. I believe staying at home with your children is a worthy and delightful calling. But who loves every minute of anything? As with all endeavors, mothering comes with good days and bad days. Good seasons and more difficult seasons. Even if you strive for a positive attitude and continually thank the Lord for His blessings, there will probably be days when you dream of just sipping lemonade at a quiet, solitary beach. Life will not always be as it is now. Though Satan tries to trick us into despair, he does not know the future, so we choose to trust God instead. That said, I don’t believe it’s helpful to indulge in daydreams of a time when the kids and life are perfect. It’s counterproductive for us to dream of days that belong in a season other than the one we’re in. And it leads to ungratefulness and a bitter heart. Myth #5: “Good Christian moms” should pour every last ounce of energy into their children. I think most of us imagine that all the other mothers would never choose to be on social media when they could be engaging their children in creative, structured activities. We feel guilty for indulging in 30 minutes of solitude. But maybe that solitude is the best thing you can do for your children. I’m not saying it should be Facebook or Instagram. We all recharge in different ways, so find out what works for you and make it a priority. Whether that’s making time to exercise (don’t underestimate the value of endorphins! ), spending quiet time in prayer and Bible study, or making sure that you and your husband get to sit down and have real conversations together, I’d encourage you to be a good steward of yourself. 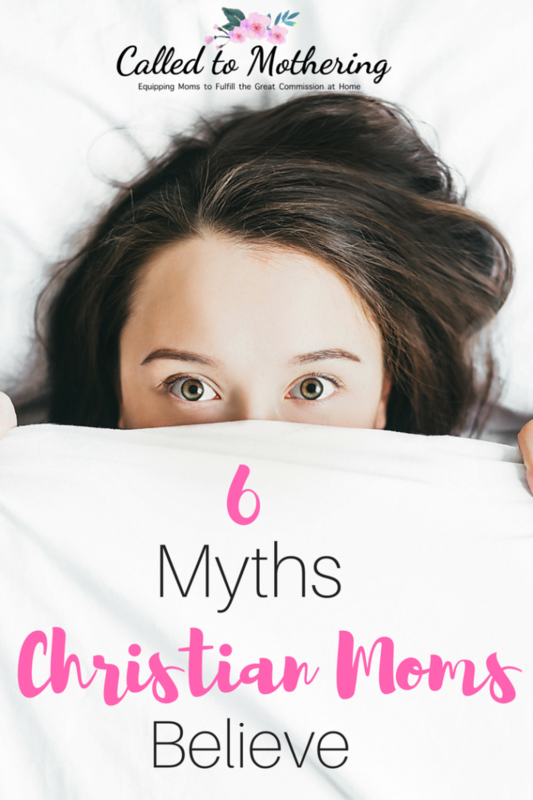 Myth #6: “Good Christian moms” shouldn’t be vulnerable with their kids. As tempting as it is, we don’t need to maintain an illusion of perfection with others, least of all our children. It puts undue pressure on them to live up to some impossible standard, and gives them a false impression of the Gospel. We aren’t our kids’ Savior. They need mothers who can sympathize with them in their weakness, that can call their own selfishness, pride, discontentment, and lack of self control by name. They need to see us turning to the Lord for help in overcoming those struggles. This shows them that they aren’t alone in their sin. Our job is to point them to Jesus, as we reveal that we are down there in the trenches with them in spiritual battle. oh my goodness! You had me at “Myth #1: “Good Christian moms” have children with stellar behavior. ” I believed every one of these for so long… but I still struggle with that one. And how their bad behavior reflects back on me… smh at the hypocrisy of that belief – that I still struggle with!